For oenophiles, scent is everything. We have thousands of olfactory filaments that allow us to smell thousands of aromas in a single glass of wine. We only have five taste zones on our tongue (sweet, sour, bitter, salty and unami). So, much of our sense of taste is actually the ability to smell. 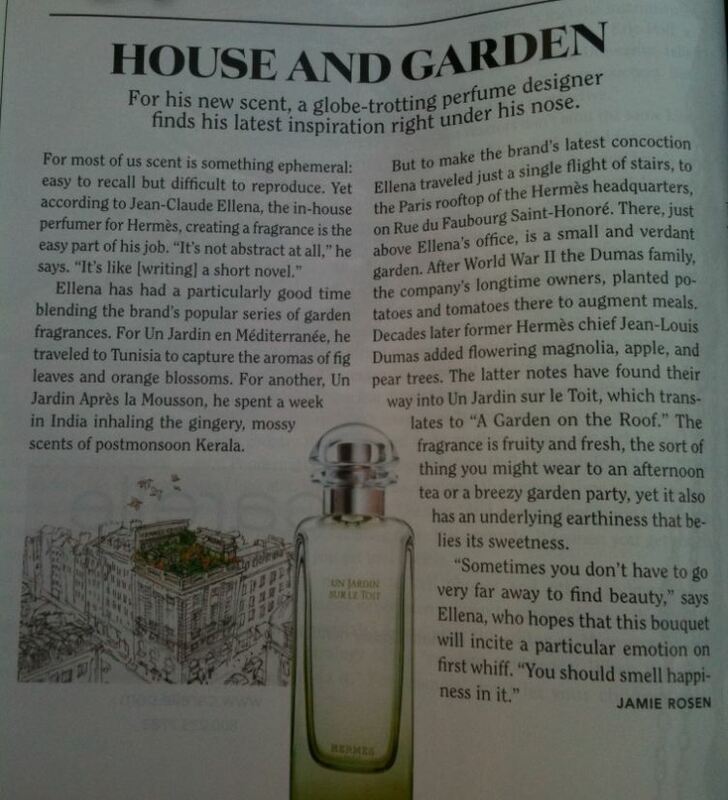 I was reminded of this as I was reading my Town & Country magazine, and came across this article about a new Hermes scent. I imagine it takes an artist of sorts to concoct a pleasant scent, just as a winemaker is an artist of the grapes – making our sense of smell and taste indulge in a symbiotic jubilancy. Read how this perfume designer got his inspiration from a rooftop garden in Paris. And remember, having a signature scent or two is completely Vinously Chic! I enjoy having a nice, fresh fragrance in the summer. However, please note that you should forego spritzing yourself prior to jetting off to a wine tasting. You don’t want that expensive fragrance competing with the aromas of the wine, and ultimately your taste sensations. This is true wine tasting etiquette, you know. I don’t want your scent competing with my experience of the wine either. Please take note.